In the Vehicle Assembly Building at NASA's Kennedy Space Center in Florida, shuttle Endeavour is lowered into place where it is being attached to its external fuel tank and solid rocket boosters, already positioned on the mobile launcher platform. The shuttle is slated to launch its final mission STS-134 in May 2011..
NASA is priming the space shuttle Endeavour for an historic final trip to the launch pad, even while its sister ship Discovery is still in orbit at the International Space Station. This week, NASA engineers moved Endeavour out of its maintenance hangar and into the cavernous Vehicle Assembly Building at the Kennedy Space Center in Florida. There, after a minor delay, the shuttle was attached to the fuel tank and rocket boosters that will help launch its final space voyage on April 19. "One mission is still going on, and Endeavour is getting ready for its next mission," NASA spokesperson Allard Beutel told SPACE.com. "It couldn't be a more visible example of our busy space shuttle operations." Initially, Discovery was slated to land March 8 with Endeavour moving to the launch the next day. Beutel said NASA officials will evaluate whether to keep both events on the same day after Discovery's flight was extended earlier this week. NASA is retiring its three winged orbiters later this year after 30 years of shuttle flight. Discovery's current mission launched on Feb. 24, beginning what is now a 13-day mission to deliver a storage room and humanoid robot, called Robonaut 2, to the International Space Station. The shuttle will return to Earth during the mid-morning on Wednesday. 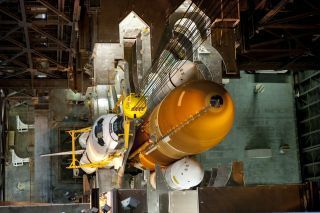 Endeavour scheduled to begin its slow trek to its launch pad Wednesday night at about 8 p.m. EST (0100 March 10 GMT), Beutel said. After Discovery's mission ends, NASA plans to fly just two more flights before shutting down the shuttle program. At NASA's Kennedy Space Center in Florida, employees hold up a banner to commemorate space shuttle Endeavour's STS-134 mission as it is moved from its hangar to the Vehicle Assembly Building on Feb. 28, 2011. The shuttle is due to launch its final mission STS-134 on April 19, 2011. The final flight of Endeavour is currently set to launch April 19 to deliver a $1.5 billion astrophysics experiment to the International Space Station. The shuttle Atlantis will follow on June 28 to deliver spare parts and extra supplies to the orbiting laboratory. Both remaining shuttle launches are expected to draw record crowds of spectators hoping to see a NASA orbiter blast off before the program ends. Discovery's launch last week drew an estimated 40,000 people, NASA officials have said. Even Endeavour's last trip to the launch pad is expected to draw a crowd, Beutel said. When Discovery rolled out to the launch pad for its final flight on Jan. 31, about 3,000 people – mostly shuttle workers and their families – turned out to see the event, he added. Endeavour could attract an even larger group of fans. With Discovery returning to Earth while Endeavour is preparing to launch, "there's obviously a lot more interest from the general public, and of course, the reporters who are covering the missions," Beutel said. "What's taking place related to Endeavour's commander…that, I think, has gotten people interested in the mission," Beutel said. The commander for Endeavour's final flight, the STS-134 mission, is veteran NASA astronaut Mark Kelly. Kelly is the husband of Arizona congresswoman Gabrielle Giffords, who is in a Houston hospital recovering from a gunshot wound to the head she received during tragic January shooting spree in Tucson. Six people were killed and 13 injured in that attack. Giffords has since been moved to a rehabilitation center in Houston, where Kelly lives and works. Last month, Kelly announced he planned to continue training for Endeavour's final voyage. He said at the time that he hopes Giffords will be able to attend the April launch. Kelly also has an identical twin brother, Scott Kelly, who is also an astronaut and is currently commanding the International Space Station. Scott Kelly is due to return to Earth later this month on a Russian Soyuz capsule. At one time, last year, the astronaut brothers were scheduled to meet up in space before delays pushed their different missions apart. "That, I think, has gotten people interested in the mission," Beutel said. "That brings them in, but they're also finding out about the mission, and what it's going to do and bring to the space station." Endeavour's final mission is a 14-day spaceflight to deliver an instrument called the Alpha Magnetic Spectrometer to the International Space Station. The instrument is a huge detector designed to study cosmic rays and antimatter, and peer into the building blocks of the universe. Kelly leads a crew of six astronauts for Endeavour's mission. Four spacewalks are planned. The mission will be NASA's 134th shuttle mission since the fleet began launching into space. It will be Endeavour's 25th flight and is will blast off just one week after the 30th anniversary of NASA's first shuttle mission – STS-1 – which launched on the Columbia orbiter on April 12, 1981.